Garth Nix - Hands down, some of the best books I've read in 2015 were by Garth Nix. I actually met him in 2014 at BEA but I had yet to read him at the time. Sabriel is now an all-time favorite of mine ♥ His writing is dark, atmospheric and filled with magic. Ernest Cline - I can not believe that I waited so long to read Ready Player One. It has everything I love: geeky references, 80's nostalgia, clever plotting, movies, music and gaming. Hell yeah! Renée Ahdieh - She's a debut author but reading The Wrath & The Dawn, you could never tell. I was blown away by her delicious prose, swoon-worthy world-building and tone...not to mention completely winning me over with her unlikely romance. Win. Victoria Schwab - I'm cheating here a bit here: I'd read V.E. Schwab last year but this was my first time reading her YA work, so it counts right?! I was just as blown away by her skills in YA as I was with her prowess in Adult Fantasy. This woman is brilliant! Tamora Pierce - Yup, I read my first Tamora Pierce book in 2015, can you imagine?! Going to a French School means that you miss out on a lot of quality English classics. This is one of those authors that I wish I'd discovered in my teens. Robin LaFevers - I have yet to read any further than Grave Mercy, but I really enjoyed it so hopefully in 2016, I'll finish the rest of LaFevers' work. Patricia C Wrede - I had so much fun with Dealing with Dragons! So.Much.Fun. It was a quick fantasy read that didn't skimp on quality characters and world-building. Patrick Ness - I was gifted A Monster Calls last year and man did that story every stick with me. I need to read more Patrick Ness so in 2016 I plan on finally reading The Knife of Never Letting Go. Kristi Charish - Another debut author that didn't fail to impress. Kristi Charish combined Urban Fantasy with a female Indiana Jones. What's not to love?! I really need to pick up Uprooted as I am almost sure I will love it. Also, Kristi Charish has a new series coming out next year about voodoo and zombies so I should probably give this urban fantasy a try too. Great list! Can't wait to read The Wrath & The Dawn! There are a few of these that I still really need to read - Wrath, Ready Player and Monster are all definitely on my TBR! TAMORA! God, she basically started my writing career. (Does it count as a career if you don't get paid?) I also read Garth Nix for the first time this year, but it was Newt's Emerald. I still haven't read Sabriel because I'm not a cool kid. Great list! A "female Indiana Jones"? I'm in... :) I'll have to check that out for that description alone! And the others sound good too. Other than Robin Lafevers, I can't say as I recall reading any of the other authors on your Top Ten Tuesday post this week, so I have some new to me authors to check out for sure. I haven't read any of these yet, but I've been meaning to read the Patrick Ness and Ernest Cline books. I'll have to check out some of the others on Goodreads! I have Grave Mercy on my to read list and Kristi Charish will be up soon on my list to read, I'm just waiting on the first book to arrive. I added Sabriel to my to-read list. 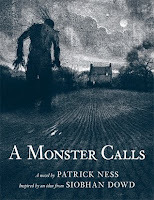 I read my first Patrick Ness book this year too, and it was A Monster Calls as well. How breath-taking was the writing? *swoons* I want to read more of his books in 2016 too. I was thinking the Chaos Walking series. Maybe we could do a buddy for them...? :) And I read Cline's Armada and enjoyed it. I want to pick up Ready Player One soon. This year was my introduction to Victoria Schwab with ADSoM, and I seriously can't believe that I never read any of her books before. I'm determined to finally get to my copy of Grave Mercy in the new year, as well as read Garth Nix's Newt's Emerald. So glad to see Naomi Novik on all these lists! She's really great isn't she? I love the first book of her Temeraire series but the sequels haven't been as great, so I was excited when she published Uprooted this year - it was so different and refreshing! LOVED The Wrath and the Dawn! Such a great choice. And you must read more Patrick Ness for sure. The Chaos Walking series is just incredible! I need to read Uprooted too, it looks SO good. Fabulous list! I REALLY need to read Uprooted, I've heard so many good things about it. Plus, it sounds awesome. I've had my eye on Owl and the Japanese Circus for a while. I should just pick it up. Armada was so much fun, I'm really looking forward to Ready Player One now. Great list! Alll these books are new to me! Great choices! You haven't read Tamora Pierce until now?! Wow! She's one of the first authors I read when I discovered fantasy back in high school. I'm so glad you're reading her stuff now! Robin LaFevers is so great too! I love the His Fair Assassin trilogy. Garth Nix I need to read more of. I've only read Newt's Emerald but plan to get my hands on the Old Kingdom series eventually. All the other authors on your list I haven't read yet! I think you might be my book taste twin. Or close relation, anyway. I read and loved half of these and have the other half on my tbr. :) I'm glad you enjoyed these! I haven't read A Monster Calls but have finished and liked the Chaos Walking trilogy. I plan on finally reading The Knife of Never Letting Go next year as well. Yes yes yes yes to Naomi Novik. I didn't read anything prior to Uprooted, and now I can't wait to see what she has in store.